In the 16th century the O’Flaherty family reigned over Connemara and the larger region of Connaught from their many castles, including Ballynahinch. Young Donal O’Flaherty, heir-apparent to the family fortunes, took as a bride 16-year-old Grace O’Malley, daughter of another powerful family. Grace proved to be as manly as any Irishman and gallantly fought at the side of her husband. When her husband Donal died (most probably he was murdered), Grace became the head of the family and took to piracy. Her exploits took her far from Ireland. She eventually met Queen Elizabeth I on equal terms. The property was sold in 1922 to His Highness the Maharaja Jam Sahib of Nawanagar, India. Known as Ranji—the Prince of cricketers, the maharaja used to come to Connemara every summer to fish. When he arrived each June, he bought five new cars and gave them away to whichever local citizen caught his fancy before he left for India in October. Ranji landscaped the castle grounds, gardens, and woods. Each year on his birthday he held a grand party for his staff and served the drinks himself. He kept trucks waiting outside to take his inebriated guests home. 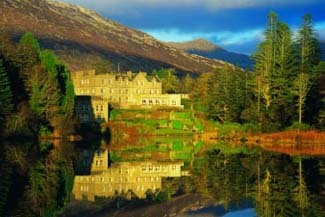 I love Ballynahinch Castle, as much for its colorful history of swashbuckling pirates, eccentrics, and maharajahs, as for its unpretentious, earthy atmosphere. If you’ve been out fishing, you’ll feel comfortable enough to walk into the bar with all your gear and enjoy a pint. Take note, too, that the present structure is more of a manor than a “fantasy” castle. Nonetheless, Ballynahinch is a wonderful and atmospheric place to stay. Open: all year except for last two weeks of December and end of January until 3rd week of February. Along N59, watch for a small signpost that reads “Ballynahinch.” Drive carefully; sheep wander freely on the road. After a few minutes, another signpost guides you onto the estate. When you step through the door at Ballynahinch, you enter a charming world of faded glory. Wherever you look, you see old photographs, oil paintings of fishing scenes, and souvenirs of the castle’s former owners. Burnished wood paneling, wooden floors covered with Oriental-style carpets, and deep, comfortable chairs give a homey feel to public rooms warmed by crackling log fires. The best guest rooms are in a new ground-floor wing that blends flawlessly with the old architecture. Four-poster beds and Georgian-style mahogany furniture decorate these deluxe rooms, and floor-to-ceiling windows overlook the river. A few even have fireplaces. Rooms bear names such as Salmon Leap, Elephant Walk, and Grace O’Malley. The dining room overlooks the river and gardens. As befits a fishing haven, lunch and dinner menus feature the catch of the day and several entree selections of salmon. The Fisherman’s Bar is a popular meeting spot for locals.